Home Stories Work That Body! 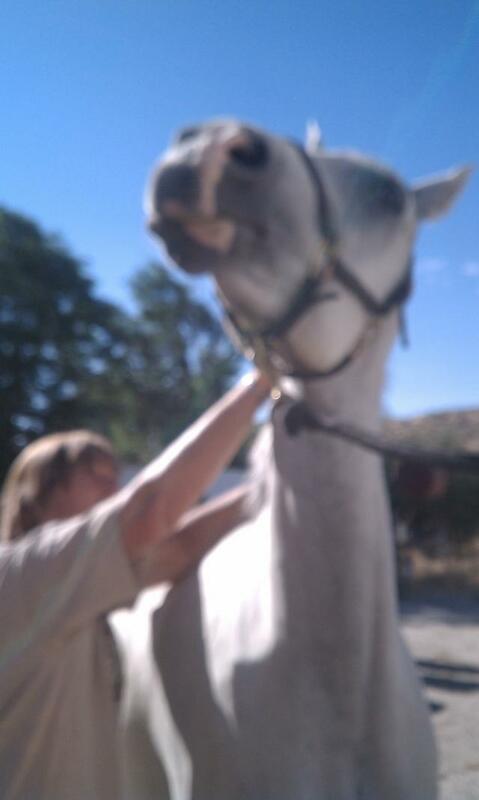 The bodies of our horses really put up with a lot, don’t they? 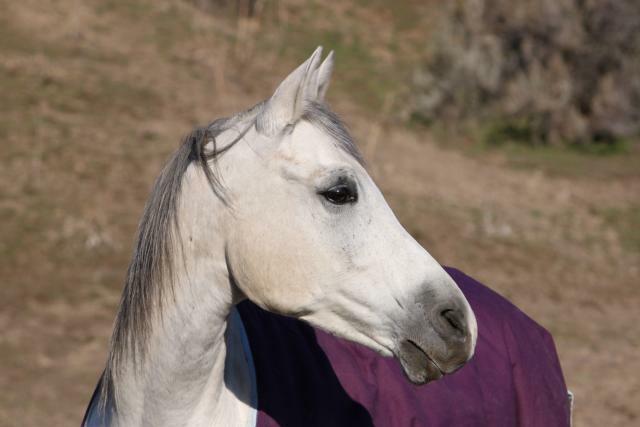 Not only are they subjected to riders and saddles and jumps and sudden stops and fast starts and headspinning turns and hundreds of miles, they are mute and unable to vocalize pain or discomfort like your or I. It’s up to us to pay astute attention to differences in our horses behavior, subtle changes in musculature or that “not-quite-right” syndrome that many may observe. I know I have talked a lot about Khopy, but I have truly learned so much from him in just the short time I have owned him. On an aside, I can’t say I have enjoyed learning some of the things he’s thought I ought to know, but the more our relationship develops the more I am beginning to appreciate all of his lessons. It has really taken much longer to form any sort of bond with him than I have ever experienced before. When I first brought him home I noticed that he carried a great deal of tension, despite a very stoic disposition. 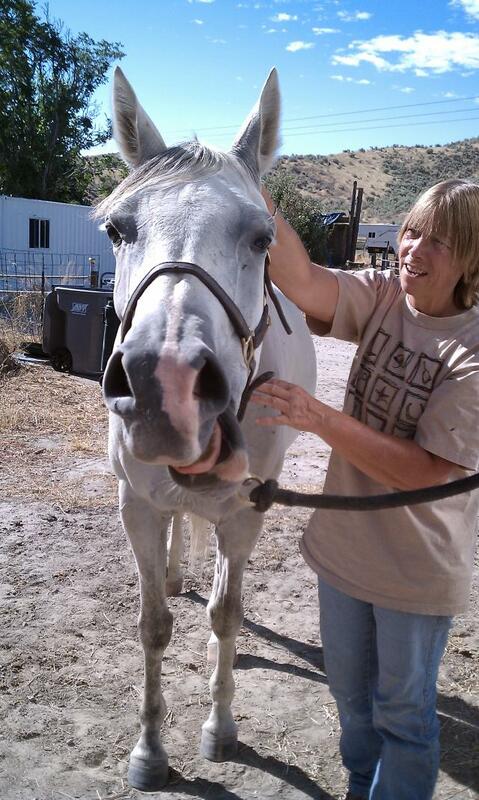 He had been living 24/7 in a stall, and had a good case of gastric ulcers. 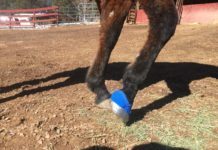 His ulcers were resolved by free-choice grass/alfalfa hay and being turned out on large acreage. 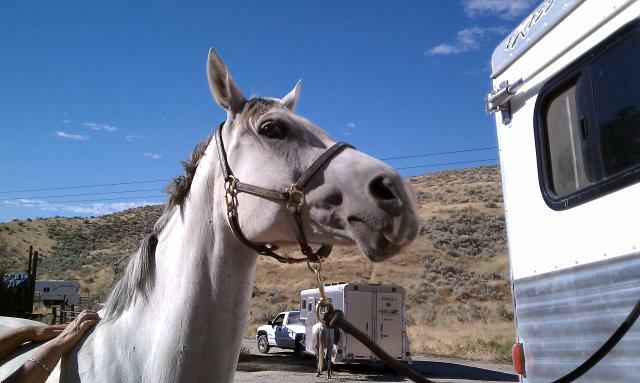 Although a beautiful picture that a friend took shortly after Khopy arriving, you can clearly see the pursed lips and pinched mouth. This was him for a couple months. The first thing I noticed was that he carried his tension in his mouth and his neck with extremely rigid and tense. I started taking him to my dressage lessons, as he carried himself heavily on the forehand from being trained with his head tied down to his chest. 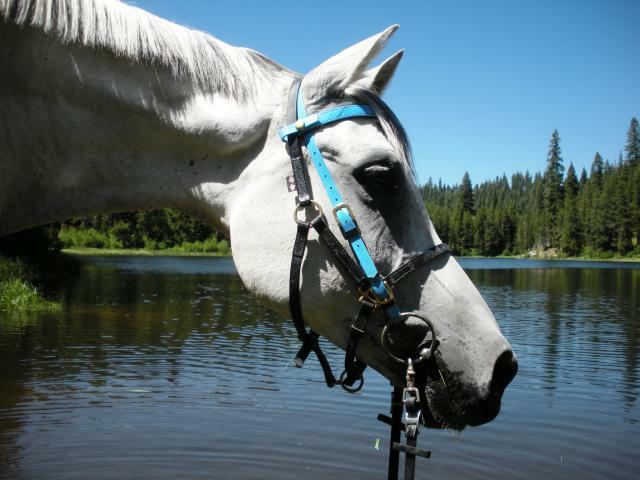 We taught him to carry himself from behind and no more martingales or other training devices! 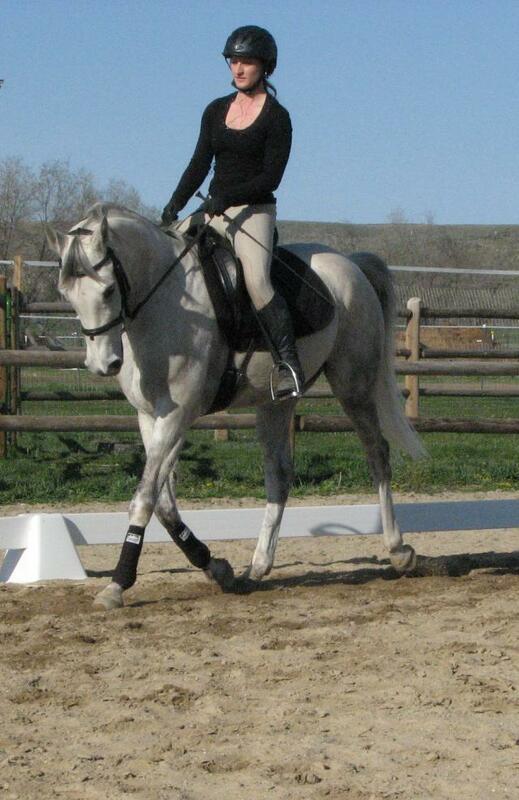 Along with dressage, I started riding him on the trails, which he really seemed to enjoy, despite a few issues! As he came to me having been barefoot for at least the past year, his feet have taken a lot of time to transition. A much, much softer eye, mouth and jaw. This expression is now the norm. Working on coming through from behind, and developing a better foundation in which to begin an endurance career. I did everything I knew to do for this gelding from when he first came home in January until the present time… turn-out, diet change, regular chiropractic, dressage/gymnastic training, proper foot care, etc, etc, but I wanted to do more. While he’s come leaps and bounds, I still felt tension in his lower neck and shoulders, which I think is residual from having a difficult transition to being comfortably barefoot. So, I called in another kind of expert! 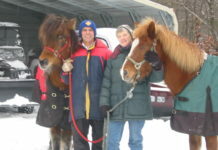 Karen Bumgarner, also an Easyboot user, has been doing equine bodywork for quite some time. We chatted one night and made arrangements for her to come out and do some work on Khopy. Much as I expected, he held a lot of tension in his neck and shoulders, specifically on his left side. 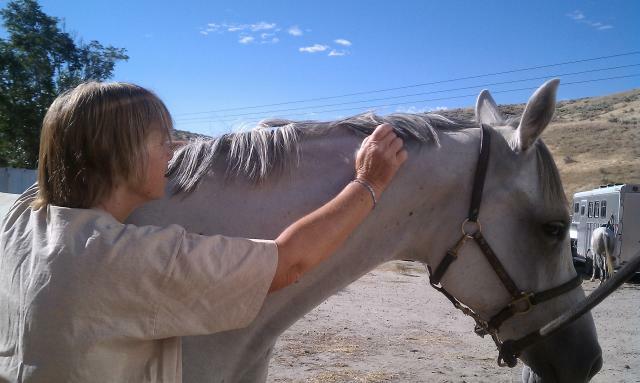 Karen worked on Khopy, finding and releasing pressure points, knots and tight muscles. She spent time at first giving him some obviously welcomed massage to gain his trust, and then began working on the sore spots. At two separate times during the bodywork, Khopy lifted each hind leg and held it tight, even though Karen was working on an entirely different area. It really showed me that even though he may be palpably tense in his shoulder, everything is interconnected. When she was done, he was visibly relaxed and the usual tight spot in his neck was much softer. I am fascinated by this and want to learn more! I would also like to learn more about possible pre-ride stretching exercises, which I really think would benefit us. What do you do as an on-the-ground warm-up for your horse? Carrot stretches? Other techniques? Any good books anyone recommends? I rode Khopy today, three days after his massage and he felt amazing. 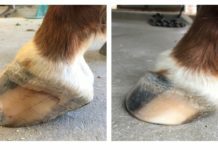 I really, really hope Easycare might consider doing a Webinar on bodywork (hint hint) and think it’s an excellent addition to the other areas of horse care that we so obsessively embrace! Bring on the knowledge! !